A potentially groundbreaking new app targeting retail financial services hopes to bring augmented reality to your local bank and credit union. Last week, Kony, an enterprise applications developer based in Austin, Texas, introduced its Digital Banking Platform. The software enables banks and financial institutions to deploy a full suite of applications that improve the customer experience. The platform covers everything from the typical digital tools for retail and business banking to next-generation technologies, such as AI chatbots and augmented reality tools. Banks and credit unions are committed to meeting the escalating expectations for a seamless, 'customer-first' experience. The new Kony Digital Banking Platform, combined with our growing portfolio of banking applications, and our strategic partnership with Diebold Nixdorf, will enable us to achieve our vision to facilitate banking anytime, anywhere, and through any channel — both physical and digital. — Thomas E. Hogan, chairman and CEO of Kony, Inc. In an interview with Next Reality, Bill Bodin, chief technology officer at Kony, previewed the augmented reality features that the company is developing with several banking clients. 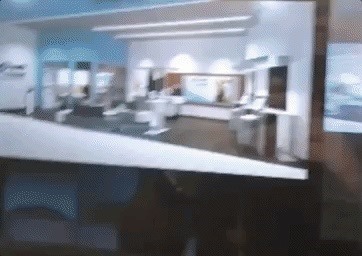 The company's main AR offering is called Branch View. 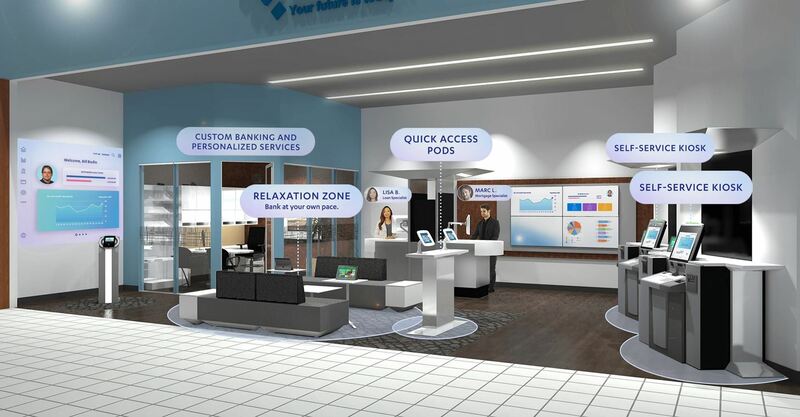 Through the camera view on a smartphone, mobile apps leveraging this feature can help customers navigate the floor plan of a bank branch, with tellers, quick access kiosks, loan desks, ATMs, and even refreshment lounges highlighted on their displays. Looking for a loan officer, safety deposit gatekeeper, or notary public? Branch View can also help customers find the right person to talk to. The AR app does this by integrating with the branch's HR systems, allowing it to retrieve employee photos, areas of expertise, and other pertinent information. Combine this data with Bluetooth beacons, and employees become points of interest within the app. 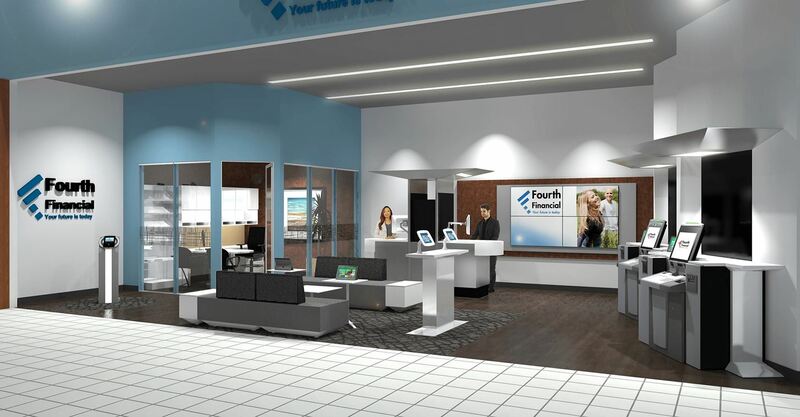 "Your ability to see that level of detail walking into a branch lends itself to personalization and sets the customer at ease with who it is that they are approaching, [ensuring] that they are not going to the wrong person," said Bodin. The app also personalizes the AR experience for customers. For instance, video displays in the camera view will highlight personally relevant and contextual information, such as portfolio data and special rates on loans. Kony's AR services also support beaconing and triangulation for navigation and notification services that would enable features such as finding nearby ATMs, particularly mobile ATMs placed temporarily for festivals and other special events. "We are developing the technology that allows you to hold up your phone like a periscope and you'll spot the ATM through all the crowds of people, and you're able to make your way to valuable services," said Bodin. Kony isn't just working with financial institutions. With its strength in data visualization, they can develop applications for a number of different industries. For example, energy companies can use the technology to model landscapes for environmental impact studies and evaluate the efficiency of wind power for an area. In addition, Kony is working with Diebold Nixdorf, a leading manufacturer of ATMs, to develop an app to assist technicians in the field. When technicians approach a machine for maintenance, the app will scan the machine for trouble codes and display knowledge base content to assist in repairs. "They understand that we've hit the breakpoint between the fad of AR and the reality of AR. One thing that's important to really drive home in all of this is the ability to incorporate real-time data into augmentations and to do it from both an image recognition perspective, a markerless technology perspective, a geospatial perspective," said Bodin. "It is important to have competencies in all of that, and we're developing solutions across the board that touch each one of those categories."